Settlers first used the term "Greenpoint" to describe a small piece of land extending into the East River at the end of what is now Freeman Street—just two blocks from Tend Greenpoint. Greenpoint is the northernmost neighborhood in Brooklyn, tucked between Newtown Creek and the East River. Historical records from that time depict the neighborhood as beautifully abundant and green. The landscape, once dotted with creeks, saltwater marshes and local flora and fauna, is now home to a growing neighborhood dotted with restaurants, shops, bars, and local businesses. The early citizens of Greenpoint developed the area into a major agricultural center. Its grains, fruits, vegetables and livestock were shipped into Manhattan as well as back to Europe. Many local streets are still named after those original farming families. Greenpoint eventually began to stand out as a shipbuilding hub, along with printing, pottery, glassworks, foundries and, eventually, oil refining. While this was an economic boon, it was an environmental disaster. In 1919 the Standard Oil refinery caught fire, spilling oil into Newtown Creek. Over the last century, up to 30 million gallons of oil—the largest continuous spill in US history—have seeped into the creek and subsequently into a 50-acre groundwater and soil plume. The spill wasn’t discovered until 1978 and still exists today. The lasting effect of this pollution still present a challenge to the neighborhood’s soil and air quality. 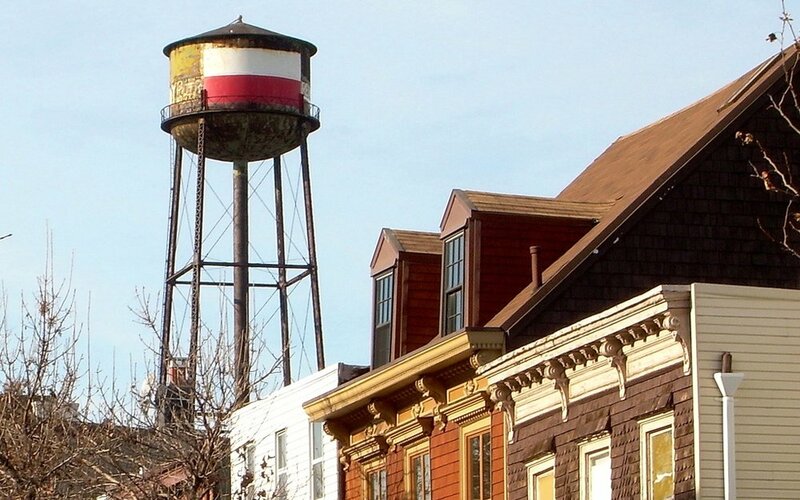 Greenpoint is returning to its “green” roots more and more every year. Organizations like the Greenpoint Community Environmental Fund, using money gained from oil-related lawsuits, have been able to fund various local green initiatives. These initiatives have focused on adding green spaces for recreation and relaxation, planting more trees in the neighborhood, funneling storm water away from our shared sewer system, and even rebuilding our public library in the form of a LEED-certified building with an environmental education center. The green is coming back to our neighborhood and Tend Greenpoint is excited to be a part of the initiative. The Greenpoint Community Environmental Fund is a grant program created by the State of New York with monies obtained through a settlement with ExxonMobil over its Greenpoint oil spill. Their goal is to fund projects that will address the Greenpoint Community’s environmental priorities. Recipients include: Greening Greenpoint and Kingsland Wildflowers. OSA works with the NYC Department of Parks and Recreation, elected officials, and the community to maintain, activate, and expand parks and public spaces in North Brooklyn. For over 40 years the Trees New York mission has been to plant, protect, and preserve New York City's urban forest through education and community participation. They have trained a number of Citizen Pruners, created an education program for young people, and planted over 5,000 trees in underserved communities. Eagle Street Rooftop Farm is a 6,000 square foot green roof organic vegetable farm locates atop a three story warehouse. Since 2009 they’ve worked with chefs within the neighborhood as well as the community. The Environmental Education Center will provide programs, information and special collections that increase awareness and stewardship of the local environment. The center will offer space for community and environmental groups to hold meetings and public events. Sign up with your email address to receive gardening news and shop updates. We respect your privacy. © Copyright 2018 Tend Greenpoint, LLC. All rights reserved.